Zeb and Haniya have said "chup" (quiet) to all those who thought contemporary Pakistani music has become a men's domain. 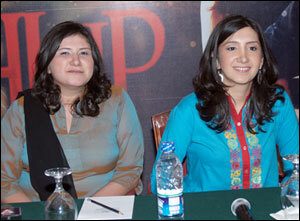 Their debut album 'Chup' is breaking new ground for Pakistani music as the first album by a female duo to be released in recent history. Zeb and Haniya have officially arrived, and that alone is a landmark event. 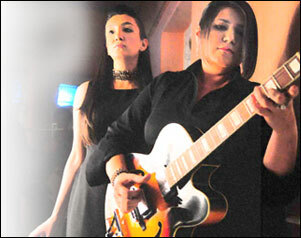 Pakistan has not seen the launch of two young talented women in the music industry in a very, very long time - and these two have made 2008 a year to remember for Pakistani music. Zeb and Haniya (or as their full names go, Zebunissa Bangash and Haniya Aslam) appeared on the Pakistani music scene a few years ago, when a song called 'Chup' by the duo started spreading like wildfire on the Internet. The song was then picked up by radio stations that began playing it. The girls of the 'Chup' fame have just launched their debut album, also titled Chup, which has been flying off the shelves at Karachi's popular music stores. Zeb and Haniya have a cult following and their fans have been waiting for their album ever since they downloaded the song 'Chup'. Produced by Mekaal Hasan, Chup also features some of the best talent we have in Pakistan today: Gumby, Shallum, Kamran Zafar, Mohammad Ahsan Papu, Omran Shafique, Hamza Jafri, Sameer Ahmed and Sikandar Mufti; as well as Norwegian musician Hildegunn Oiseth. The album opens with the song 'Chup' and the vocals on this are a treat to listen to. 'Chup' is this sweet, folksy song that packs a jazzy punch because of the use of the trumpet, played by Hildegunn. It has very simple lyrics yet the song is very endearing. The next track 'Kabhi Na Kabhi' has darker undertones - it evokes images of old black and white films and would be perfect for an indie film soundtrack. Paimana Bitte' is by far one of the best songs on the album. This traditional folk song is sung in Pashto and Dari and it brings home the charm of great world music: that it strikes a chord to someone who can't understand the language. Zeb and Haniya outdo themselves on this track, and Hildegunn's use of the horn is fantastic. It draws to a whispery close all too soon! With this song, Zeb and Haniya have proved that Pakistani music can be produced in an avant-garde manner using regional languages, and one hopes more musicians follow their example instead of constantly warbling badly accented English songs. The next track 'Kahaan' is fairly forgettable and it highlights the only issue I have with the album; that listening to it from start to finish makes it feel slightly monotonous. Whereas, if you listen to the songs individually they're all great listening. Perhaps the CD would make for a better hear if the track listing was done in a better way. Chal Diye' has an absolutely beautiful guitar arrangement - kudos to Shallum, Kamran, Haniya and Mekaal, and the song's vocals have more of a classical flavor as opposed to the earlier tracks. 'Ahaan' is another track to keep an ear out for - this alternative pop song will be a big hit if Zeb and Haniya opt to make a video for it. The ironic thing about the album is that while the lyrics are incredibly simple and on paper would look like love songs, the way this album has been pronounced doesn't make it feel like an album that is only talking about love - Zeb and Haniya's vocals and the music arrangement put an odd twist on the words. on the sidelines and sing the song in the video. The line 'raat thee teri to ab din hai mera' (if the night was yours, the day is mine) jumps out - and the song finishes off with mélange of guitar and drums, proving how much better live drums sound on an album. 'Ban Kay Touri Jogan' features Zeb on vocals and is probably the most fast paced song on the album. Zeb holds her own in the face of lyrics that one would usually hear from classical music singers, and it is perhaps the most befitting end to this album. After listening to the album multiple times, I'm left reaffirmed with the fact that Zeb and Haniya can hold their own in the Pakistani music industry. Chup showcases their talent at singing, guitar and songwriting but more importantly, how to translate that talent into great music.